The Directorate General of Civil Aviation (DGCA) has advised airlines to operate relief flights to flood affected Kerala and not to overprice air tickets. Airlines are “advised to ensure that airfares for flights to and from Trivandrum and Calicut airports in Kerala are kept at optimal level proportionate to sector distance so that travelling public is not inconvenienced,” a person familiar with the development said on condition of anonymity. While Kerala is facing probably its worst floods in a century, Tamil Nadu engineers have said that their digital water level recorders in Mullaperiyar dam are now malfunctioning and hence they are unable to record water levels accurately in the dam.So they are measuring the same manually from ordinary gauge posts installed in the river, which Kerala said is prone to error, more so given the extreme weather and wind conditions at the dam site.The development is important since Kerala has often raised serious concerns on the safety of Mullaperiyar, one of India’s oldest dams dating back to the early 20th century. Earlier Supreme Court had stipulated 142ft as the safe maximum level for the dam. Tamil Nadu claims the dam touched 142ft on Wednesday following heavy rains, and raised all shutters. But the present development puts a doubt on whether the dam stored more water than safe.Kerala chief minister Pinarayi Vijayan called such events “inappropriate”, in a letter to Tamil Nadu chief minister E.K. Palanisamy on Wednesday, while asking his counterparts to intervene to bring down the water level to a safer 139 ft.
Civil aviation minister Suresh Prabhu says all airlines have been asked to reschedule their Kochi flights from Kerala’s two other airports at Kozhikode and Thiruvananthapuram. The Kerala floods claimed 25 lives today, said CM Pinarayi Vijayan. Eleven deaths were reported from Malappuram alone, Hindustan Times quoted officials as saying. Vijayan said the heavy rains would continue for some more days, which will further worsen the situation. Not just the Kochi airport, the city too came under water due to Kerala floods today. Shashi Tharoor is a member of parliament from Thiruvananthapuram. PM Narendra Modi tweeted that he has spoken with CM Pinarayi Vijayan on the Kerala flood situation. Air India says on Thursday, 16 August, its Kochi-Sharjah-Kochi and Kochi-Bahrain-Kochi flights will operate to and from the Kozhikode airport. All other Kochi-bound Air India flights will operate from Thiruvananthapuram airport.Vistara says it will reroute its Kochi passengers to or from Chennai with no change fee or additional fare on space available basis, for those who wish to use this option. However, passengers will have to arrange their own road transport between Chennai and Kochi. Kerala CM Pinarayi Vijayan will hold a press conference at 7pm regarding the floods. It has also been decided that an army engineering group will be deployed to restore basic infrastructure in the state. Thiruvananthapuram MP Shashi Tharoor has suggested MoS (civil aviation) Jayant Sinha to divert Kochi-bound international flights to Thiruvananthapuram instead of Mumbai as it is causing great discomfort to Keralites. Rescue operations are underway in flood-hit areas of Mysuru. Presently, 35 reservoirs in the State are releasing water. Many districts in the State are facing floods. Red alert has been issued for Ernakulam, Idukki, Palakkad, Malappuram, Kozhikode, Wayanad, Kannur, Kasargod, Thrissur, Kottayam, Alappuzha, and Pathanamthitta districts. Locals of the flood-affected Baradi village in Karnataka’s Kodagu district unfurled the tricolour earlier today. Karnataka chief minister H.D. Kumaraswamy has directed the district collectors of Kodagu, Dakshina Kannada, Hassan, Chikkamagaluru and Shivamogga districts to be on high alert in view of the heavy rainfall. He has also appealed to concerned district in-charge ministers to review situation in their districts. 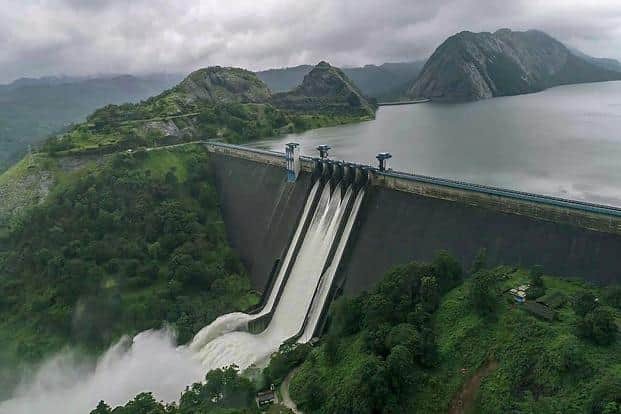 The Idukki dam has been reopened again because the Mullaperiyar dam, bordering Tamil Nadu, is overflowing at twice the rate since today morning. 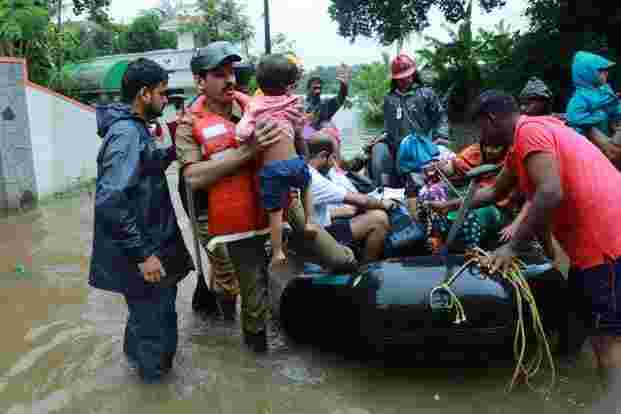 Fire and Rescue personnel evacuate local residents in an inflatable boat from a flooded area at Muppathadam near Eloor in Kochi’s Ernakulam district, in Kerala on Wednesday. 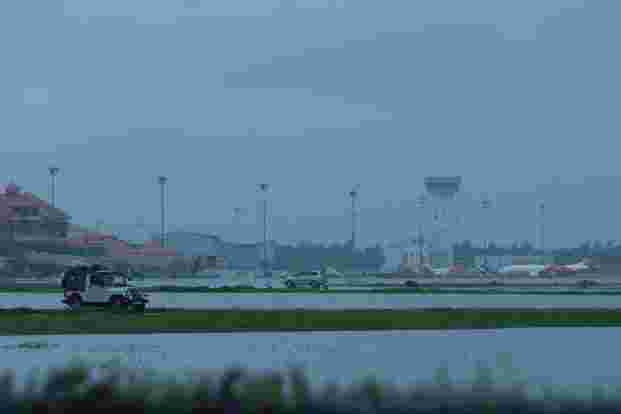 Kerala today suspended all flights at Kochi airport for three days as severe monsoon flooding took a growing toll in Kerala state. The India Meteorological Department (IMD), in its latest weather update, has issued a Red Alert in 14 districts of Kerala. Nidheesh M.K. Water entered parts of Palakkad after gates of Malampuzha Dam were opened on Tuesday. The Jog Falls in Karnataka’s Shimoga region. Kerala’s plantation industry is staring at a total loss of over ₹ 900 crore from floods and landslides ravaged key areas of Idukki and Wayanad. Spice plantations in Munnar are witnessing an unprecedented amount of damage due the rains, with roads and properties collapsing under surging water levels. The state’s rubber belt—Kottayam and Pathanamthitta—are also heavily affected. Kerala produces an estimated 85% of India’s rubber.“We are very badly affected, production in the last two months has been only 70% of what it was last August. 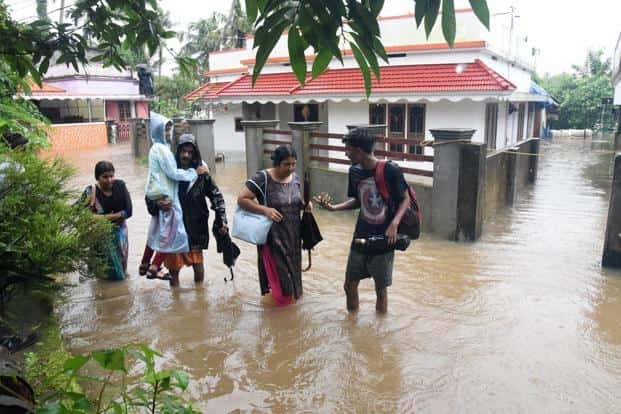 The water level is very high in most areas, Munnar is totally washed out and cut off from the mainland,” said Vinay Raghavan, vice president of Harrisons Malayalam Plantation. “The permanent damage is yet to be evaluated,” Raghavan added. Nidheesh M.K.